Hafthor Bjornsson of Iceland competes at the Deadlift for Max event during the World's Strongest Man competition at Yalong Bay Cultural Square on August 24, 2013 in Hainan Island, China. Bjornsson married his girlfriend over the weekend. "The Mountain" is off the market. Hafþór Júlíus Björnsson, the gigantic 6'9 actor who portrays Ser Gregor Clegane — aka “The Mountain” — on "Game of Thrones", walked down the aisle with his girlfriend Kelsey Henson over the weekend in Iceland. The blushing bride stands at 5'2. The couple posted pictures across social media marking the occasion. "Looking forward to pulling this big guy around for the rest of my life," Henson captioned her photo. 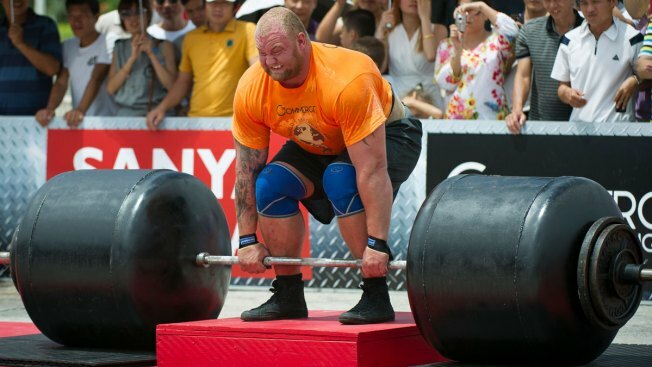 Björnsson was named the "World’s Strongest Man" earlier this year in a strongman competition organized by IMG after finishing as the runner-up in the 2014, 2016 and 2017 competitions. "Game of Thrones" is scheduled to return to HBO in 2019.